“How was it?” I was asked when I came back from TEDWomen 2018. It was so hard to answer! I had the immense privilege of attending my first ever TEDWomen event earlier this month. I still find it hard to describe it in just a couple of words. It meant so much to me on so many levels. I will try to explain. TEDWomen is the annual conference by TED that focuses on discussing the advancement of women in society. It brings together speakers from all over the world who tackle today’s social, political, environmental, and technological issues and offer solutions with their own doing. TED is a globally recognized platform that allows groundbreaking ideas to find their voice and spread their message across the globe through talks, podcasts, events, and online content. Imagine being in a room full of women and men who deeply care about and understand women’s advancement in society—advancement at work, at home, in their social environment, in their own selves. It was like being at a concert and singing each song with not just your voice, but with all the voices around you, too. The music reaching the sky. An endless symphony of possibility. First, it is important that you focus on the seat at the table and find your voice. Then you must do something else: get a loudspeaker. 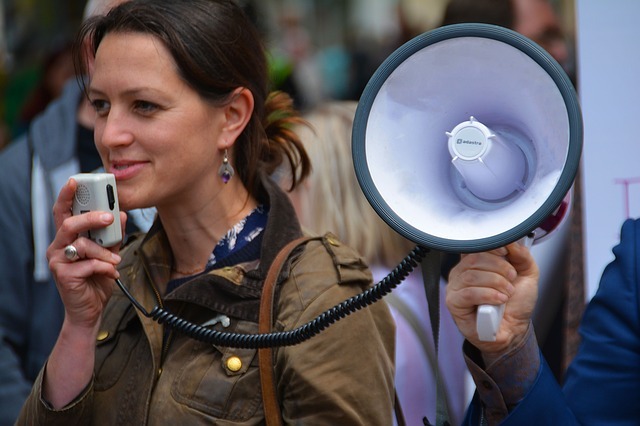 Having a voice is an essential part of the equation. Try to be heard beyond the walls, borders, and barriers and reach those who need to hear you so that they will break into the room and start singing with you. Many if not all “women’s issues” are indeed people’s issues. What we need is what everyone needs. What we propose would benefit more than a half of the population! Organizations should change the way they look at us in the workplace and ensure they hear our concerns and proposals so that they can then implement change for everyone. So many journeys of self-discovery lead us to become the person that we needed and did not have when we were little, or the one we wish we had had by our side through hard times and never found. This shows how powerful our intentions can be once we decide to change things for the better. Empathy is one of the driving forces of success, for those who practice it and for those who receive it. Tarana Burke, activist and founder of the #MeToo movement, based her talk on this golden rule. Taking structural biologist Karissa Sanbonmatsu’s words, all in all we are women “trying to figure out what it means to be a woman.” It is important to know that each of us is responsible for our future story. Each of us. I will pick up my loudspeaker and continue to relay that TEDWomen was an incredible experience, and I hope you get a loudspeaker and share your voice, too. Paola has always been passionate about diversity and women’s empowerment, in her personal as well as professional life. She started blogging about her favourite topics but quickly realised that to bring about change, she had to take real action. She could not limit herself to speaking about empowering other women. She wanted to meet them face-to-face and work together as a team to make change happen and move forward together. The NOI club was born in 2015 to serve this purpose. The NOI Club is a global community of women with projects and businesses. The NOI kindness culture is what sets it apart and with a growing community of over 3,500 people, this culture of kindness can even be felt online. The community’s offering extends both on and offline, from the NOI Club closed Facebook group, website and newsletter to offline events designed to inspire, empower and connect. In 2017 the Club furthered its international reach by holding their first New York based event and earlier this year, found a permanent home in London at The Curtain Membership Club, Shoreditch.